This is a splendid opportunity for adventurous trekkers for the Everest Base Camp Cho La Pass Trek. Everest Base Camp Cho La Pass Trek takes the enthusiastic team to fabulous Gokyo Valley. It is the source of grand Dudh Koshi River the large Ngojumba Glacier. Since It is famous as it offers the views of Gokyo Ri and Kala Patthar while the team treks to Everest Base Camp. 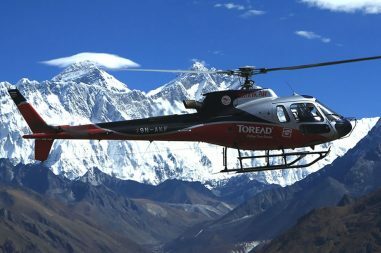 The trek traverses the magnificent landmarks of Everest region. As you will experience the lush landscape, forests, monasteries, people, culture, mountainous lifestyle, glaciers and glacier lakes. Above all, your walk to the Everest Base Camp will be an achievement; a trophy for a lifetime. Hence, You can experience the best views of mountains. We can experience diverse wildlife in their natural habitat and breathtaking views of enchanting lakes. For the amazing trekking in Nepal journey Everest Base, Camp Cho La Pass Trek includes the Everest Three High Passes Trek too. From Gokyo, Ri several views of the mountains can be observed. Some of popular are Everest, Lhotse, Thamserku, Makalu, Ama Dablam, Choyou, Cholatse, etc. Especially, It features with the snowy mountain peaks, blue lakes, and glaciers. This compels trekkers to visit the valley as a side trip during their Everest Base Camp Trek. We can have a look at the marvelous ice edge standing between Gyachung (7922m) and Cho Oyu. This is the most spectacular part of the trek. And, traversing Cho La, a high pass set 5420m height into Khumbu is just awe-inspiring. So, Book the amazing trekking in the Everest Base Camp and the Cho La Pass trekking with us ty and quality service. Bharal Adventure Pvt. Ltd. Therefore, You will experience the amazing journey of Nepal with us with the best hospitality. We will be staying at Apsara Boutique Hotel, a 3-star hotel in Kathmandu; and teahouses during the trek. All accommodations are on twin-shared basis and Single supplement will be served on request and will cost an additional USD 100. Bharal Adventure will arrange rooms with attached washrooms; however, teahouses in some places only have shared washing and toilet facilities. Also note that single rooms are readily available in Kathmandu and the trekking regions at lower elevation but it might be difficult to find them at higher elevations. All meals will be provided during trekking while only breakfast will be available in Kathmandu. There will also be welcome or farewell dinners for guests. While on trek, we have breakfast and dinner in the tea-houses/lodges we spend the night and lunch on our way to the next destination. Nepalese, Tibetan, the more common continental and Indian cuisines are common choices in the menu. The Everest Region is no doubt an amazing wonder in Nepal. Future generations have just as much of a right to appreciate it as much as we do. Therefore, we believe that the tourism industry has an obligation to protect and preserve it. Bharal Adventure employs a 'zero impact' policy on the natural environment and the traditional communities that live there. Bharal Adventure, therefore, enforces a number of do's and don'ts. Please talk to your trek leader to avoid environmental impacts. The Long Everest Base Camp Trek is a moderate trek. Travelers who can walk up to 6-7 hours a day on an uphill and downhill trail will find this trek fulfilling. It is best that we prepare ourselves for the Everest trek by jogging and exercising regularly at least a month prior to the start of the trek. Trekking to the Everest Base Camp should be relatively easier for those who have experience walking/trekking in a high altitude environment. Past hiking experience would be an asset but no technical skill is required for this trip. It is also important that we consult our doctor. Participants with pre-existing medical conditions such as heart, lung, and blood diseases should inform Bharal Adventure before booking the trek. The best time to trek to the Everest Base Camp Cho La pass Trek is Spring (March to May) and Autumn (September to November). The temperature is moderate in these seasons and guarantees amazing views through the trip. Although this trek can be undertaken during winter, the cold temperature might not be suitable for everyone. The guests shall be greeted by a representative of Bharal Adventure who is responsible for taking them to their hotel upon their arrival. The dinner comprising of authentic Nepali food is the preliminary firsthand experience of the Nepali culture that the company offers you. A guided tour around the historically and spiritually significant landmarks in Kathmandu will be scheduled after breakfast. These landmarks constitutes of Pashupatinath Temple, Swayambhunath – the Monkey Temple, Boudhanath and Kathmandu Durbar Square. In the afternoon, pre-trip discussion session will be arranged enabling the interaction between trek leader, crew and the guests. An early morning flight from Kathmandu rewarded by breathtaking views of green and white mountains takes the team to the gateway destination, Lukla from where the trek begins. After assembling other crew members in Lukla, the convoy shall commemorate their trek through the prosperous village of Lukla to Phakding. A pleasant walk through Dudh Koshi River rewarded with the magnificent view of Mt. Thamserku (6,608m/21,675 ft) at Benkar village begins just after breakfast. Passing through the villages, trails and bridges takes the team to the entrance of Sagarmatha National Park at Monjo. Descending from there to Jorsale village, team starts the climb to Namche Bazaar as they arrive at Hillary Suspension Bridge. The mystifying sights of Kwangde Peak, its sister peaks Kusum Kangaru, Mt. Everest, Lhotse, Tawache and many other enchanting snowcapped mountains compels the convoy to take a break at Chautara and admire the spectacle. An hour walk further and the team reaches Namche Bazaar, the colorful city and main trading center of the region. For acclimatization, either a day’s hike to Thame or Khunde is recommended. If not, exploration of Namche Bazaar itself could be arranged where the travelers will have a chance to discover and learn about the Sherpa culture, biodiversity of the Everest region and assortment of things related to the first Everest ascenders. Namche is the major trading center of the region that has restaurants, ATMs, a bakery and colorful market each Friday evening and Saturday. Also a few hours’ side trip to Khumjung Valley could be arranged where the travelers could take delight in local culture existing amidst the glorious mountain views. A steep climb up to Kyangjuma Village is accompanied by the views of Thamserku, Katenga and Ama Dablam peaks. From here begins the most strenuous ascend of the day to Mong La, an extremely charming place perched on the vicinity of Mt. Khumbila accommodating an ancient historical Chorten at the center of its settlement area. A relaxing lunch in the area and the trek ahead is pleasing with the scenery of abundant plants and vegetation including wildflowers and rhododendrons accompanied by wildlife throughout the journey to Dole. For acclimatization, a trek to Gokyo Ri will be arranged on this day with the exciting prospect of visiting the other three mesmerizing lakes of the Gokyo Valley. 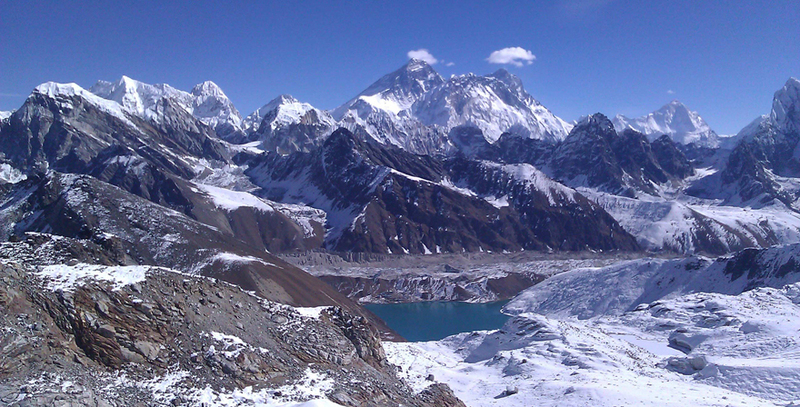 Thonak Tsho and Ngozuma Tsho are the fourth and fifth lakes beyond which the base camp of Mt. Cho Oyu and Gyachung Kang being only a stone’s throw away. The further exploration to the sixth lake shall depend upon the interest and time available. Gokyo Ri will be scaled today if it hadn’t been done the previous day. The three to four hour climb is arduous, however, totally worth it! The views of the glaciers, lakes and peaks are awe-inspiring and mystifying. 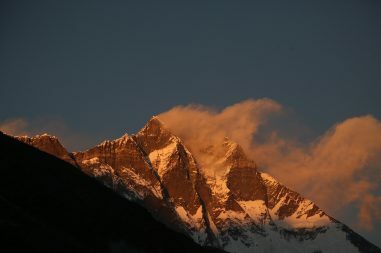 More mesmerizing is the sight of sunrays kissing the Everest. After descending the Gokyo Ri, lunch will be served just before we proceed on our trek to Thaknak. One of the toughest days of the journey, trek to Cho-la Pass and Dzongla starts early at around 4-6 am. The steep trek includes a glacier traverse on the eastern side. Passing through frozen lake, steep and rocky trails and some crevasses, the convoy descends to Dzongla after the tough ascend to Cho-La Pass. A short walk with more time for observation and relaxation fills this day with the transfixing views of Ama Dablam, Kangtega, Thamserku, Thaboche until the team arrives at Lobuche. The trail to Gorak Shep goes through the lateral moraine of the Khumbu Glacier convoyed with the revelation of Mt. Everest, Mt. Pumori, Mt. Mahalangur, Mt. Lingtern and many more. A small ascend to Thangma Riju with further steep climb through the torrent of Changri Glacier takes us to Gorak Shep. A quick lunch and rest enables us to trek along the trail to Everest Base Camp through the once immense Gorak Shep Lake. An early morning trek to Kala Patthar will commence on this day to witness the mesmerizing view of first day light embracing Mount Everest. Since it begins before the first light of dawn, dark and cold temperature is expected. After descending from Kala Patthar, breakfast is served. Descend to Pheriche shall commence as soon as all the team members have returned from their morning trek. The route traverses through Dunghla, Khumbu Khola, Pheriche, Orsho and Shomare until Pangboche from where the footsteps are retraced down to Imja Khola and up through the forest to Debuche. If the trek is organized during the full moon of November or December, the convoy acquires a chance to witness the Mani Rimdu festival in Tengboche. After lunch in Tengboche, the trail follows the Dudh Koshi gorge descending rapidly through pine forests disembarking at Sansa moving further down up to Namche Bazaar. Despite the route being the same, the journey from Namche Bazaar to Lukla feels completely different blessed with the views of open plains, rhododendron and pine forests and snowcapped mountain peaks. 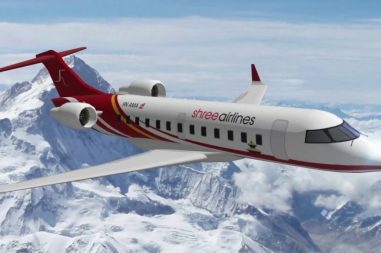 The forty minute early morning flight to Kathmandu enables the team to either plan more sightseeing in Kathmandu or spend the rest of the day relaxing and shopping for souvenirs in Thamel with or without assistance of representative from Bharal Adventure. To commemorate the end of the adventurous expedition in the land of mountains, a farewell dinner shall be organized where the guests will have one more chance to indulge in the delicacy of authentic Nepali meal before they plan their next tour to the country. The mountain expedition marks its end today with the team bidding goodbye to each other and sharing their farewell and well wishes during and after breakfast. The guests shall be escorted to the airport by a representative of Bharal Adventure three hours before their scheduled flight. Please use this checklist as a guideline for getting information on the required equipment to carry on a trekking. Adjustments could be made to the list according to your needs, interest and duration and season of the trip among other factors. Variety of these gears could be hired or bought in Kathmandu. Since the majority of these gears found in sale in Kathmandu are locally manufactured, they are a lot cheaper. Also some gears are imported from China which are of better quality.